Cicinnurus regius Linnaeus, 1758, East Indies. Two subspecies. English: Little king bird of paradise; French: Paradisier royal; German: Königsparadeisvogel; Spanish: Ave del Paraíso Soberbia. 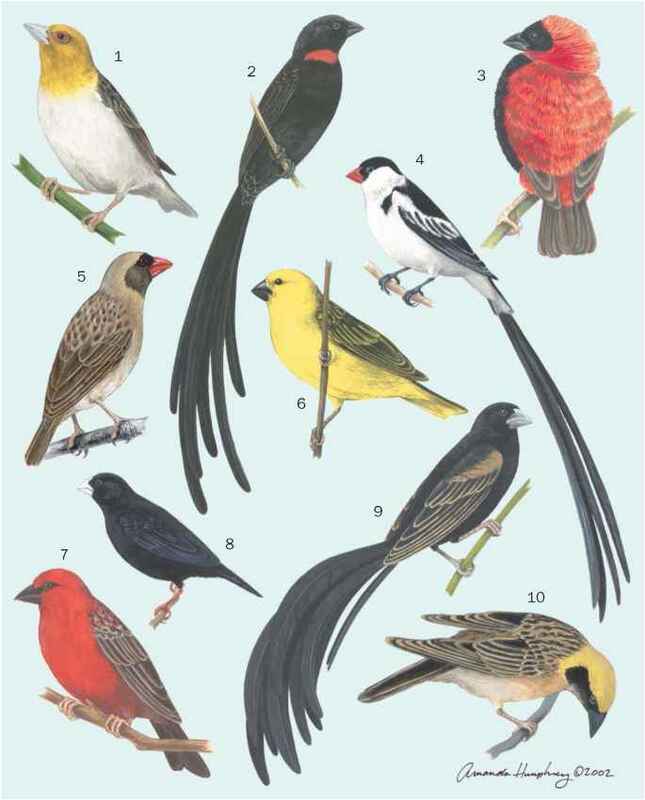 6.3-7.5 in (16-19 cm), but 12.2 in (31 cm) if central rectrices of adult males included; female 0.08-0.13 lb (38-58 g), male 0.10-0.14 lb (43-65 g). Head, upperparts, and chin to upper breast is crimson, with an orange wash on the crown and darker throat. Jet black spot directly over eye. Narrow, dark green iridescent breast band with whitish lower breast to vent. Undertail and mantle feathers olive-brown, with iridescent green tips to the mantle "cape". Long central retrices with brownish disks at the ends. Violet legs, bill ivory-yellow. Females have dull olive head and upperparts with yellowish un-derparts and violet legs. Throughout the majority of lowland New Guinea mainland and Aru, Missol, Salawati, and Yapen islands; from sea level to 3,115 ft (950 m). C. r. regius: Aru, Misool, and Salawati Islands, the Vogelkop, all of south New Guinea, and the northern watershed of southeast Papua New Guinea from Huon Gulf to Milne Bay; C. r. coccineifrons: northern watershed of New Guinea from the east coast of Geelvink Bay eastward to the Ramu River. Birds of the north coast of the Huon Peninsula remain to be subspecifically identified. Lowland rainforests, gallery forests, forest edges, and disturbed and tall secondary forests. An inconspicuous species except for males at their display trees. Adult males are perhaps more persistent callers than any other birds of paradise. Courtship involves complex vocalizations, feather manipulations, and body posturing/movements including hanging fully inverted and pendulum-like swinging. The diet consists of fruits and animals. Foraging occurs at all forest levels. Birds often join mixed species foraging flocks to seek arthropods in the lower forest. Polygynous, with solitary or lekking, sedentary, promiscuous adult males dispersed at traditional display tree perches. Breeding occurs at least during March through October. The open cup nest is built into a tree cavity (unique within family), within which two eggs are laid. Female builds the nest and cares for the young without male assistance. In captivity, incubation lasted 17 days and the nestling period was 14 days. Not threatened; widespread and abundant.